As you can see, I've been painting more pink this week! 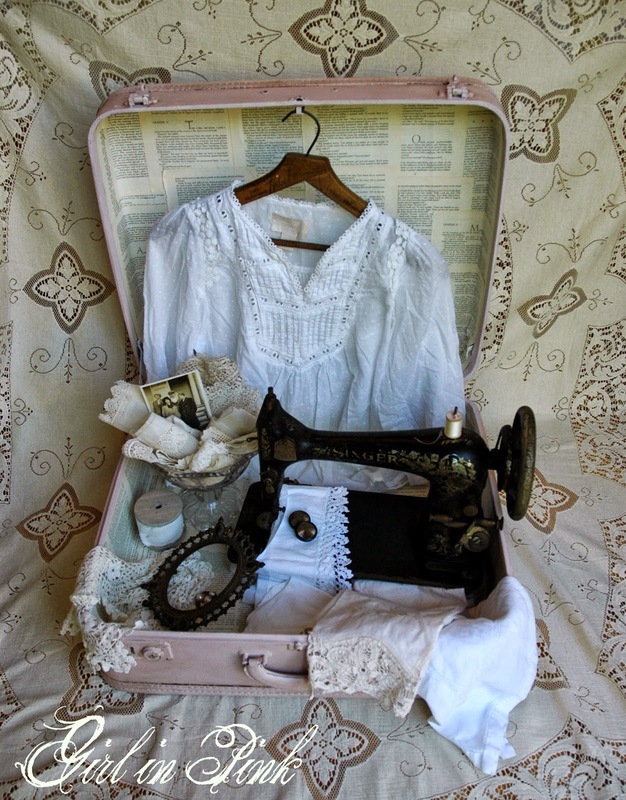 While working on making over a few vintage suitcases and trunks, I ran into some issues that required creative thinking to resolve. I also dreamed up some ideas on how to use these freshly made over pieces and thought I would share those with you here, along with some of the solutions I came up with for fixing the problems I ran into. 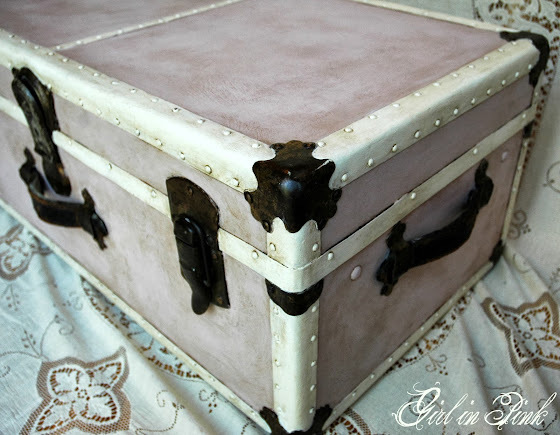 This trunk has been sitting in the garage awaiting a makeover for many months now! See all of that tape residue in the before photo? I tried some of the "goo" remover solutions but none of them seemed to do the trick. I finally decided to try painting right over the top of it, thinking it would just add some texture, right? Right, indeed! Chalk Paint® Decorative Paint by Annie Sloan covered all of that right up and after a good waxing, it has a beautiful, durable new finish. Honestly I can only see signs of that tape residue in a couple of small places, and it really just adds to the patina! When making over suitcases and trunks, I will often paint the hardware a contrasting color. 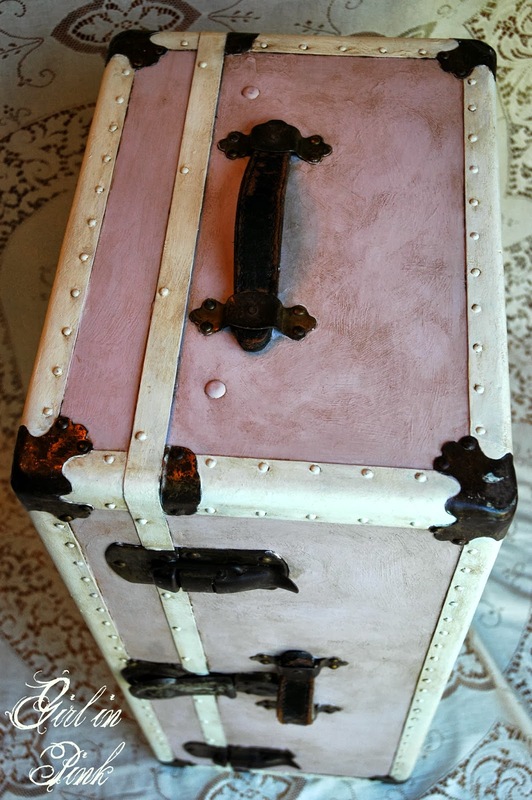 I loved the antique gold patina on the hardware of this trunk and therefore decided to leave it and let it be the focal point of the finished piece. It was a little time consuming, but I just took a small paint brush and worked carefully around each piece. I think the end result is well worth the extra effort! I painted this piece in Antoinette accented in Old White followed be clear and dark wax. It looks lovely with my other craft storage pieces in my studio and fits perfectly under my desk! I am considering using it to house my printer and paper! It will require a bit of retro-fitting and when I get around to it, I will share the results in another post! This vintage suitcase had the most horrible odor. Had I noticed the smell at the barn sale where I found it, it probably wouldn't have come home with me. The interior looked really nice...no stains, rips or holes. I had hoped to preserve it. I read about all kinds of methods for getting rid of odors...coffee beans, dryer sheets, vinegar, Febreeze. I tried them all...and gave them ample time to work! All of those things help to mask an odor, but they don't actually remove it. I finally decided that the fabric would have to be removed. Do you know what I found under the suitcase lining? MOLD! Yuck! So, keep that in mind if you have an old piece of luggage with a musky odor. No amount of Febreeze is going to get rid of that! I don't have a specific method for removing suitcase lining, just grab a hold of it and pull! Once I had it all out of there, I cleaned it up the best I could and painted the interior with Kilz primer which is designed to block stains and odors. I then left the suitcase open in the garage to dry for a couple of days and applied a second coat of Kilz. I had to make sure that mold was gone for good! 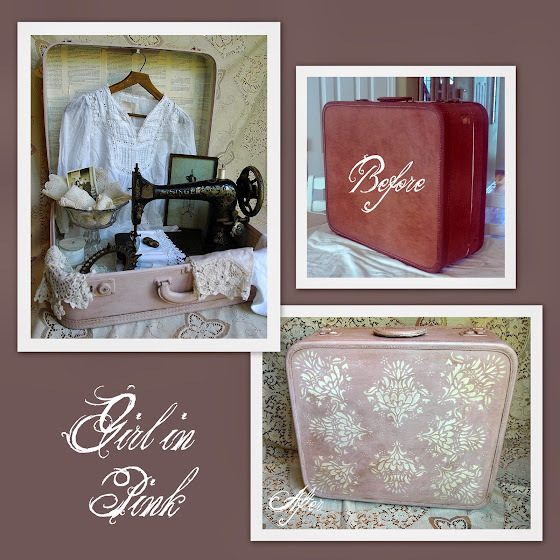 Once the primer had completely dried, I decoupaged book pages to the suitcase interior. 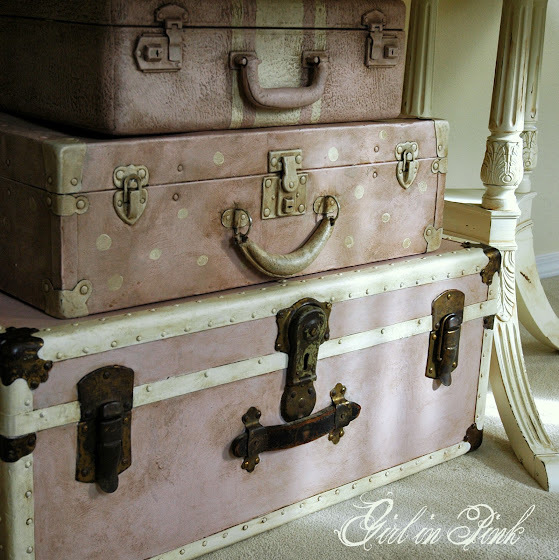 Suitcases and trunks are great for all kinds of storage but I love the idea of using them to display a vignette as well! This suitcase was perfect for this as it stays open nicely on it's own and even has a hook for holding hangers. 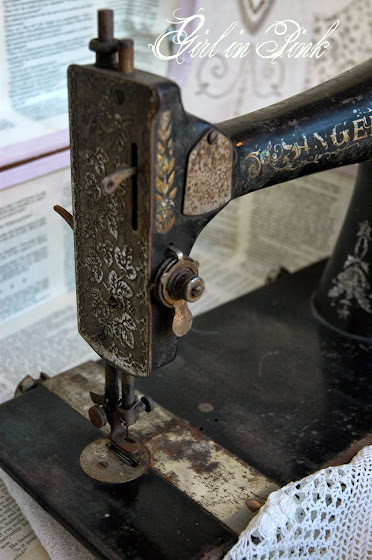 I picked up this amazing old Singer sewing machine while on a little road trip with my mom a couple of weeks ago. It's in pretty rough shape but just look at those sweet birds! I love it! 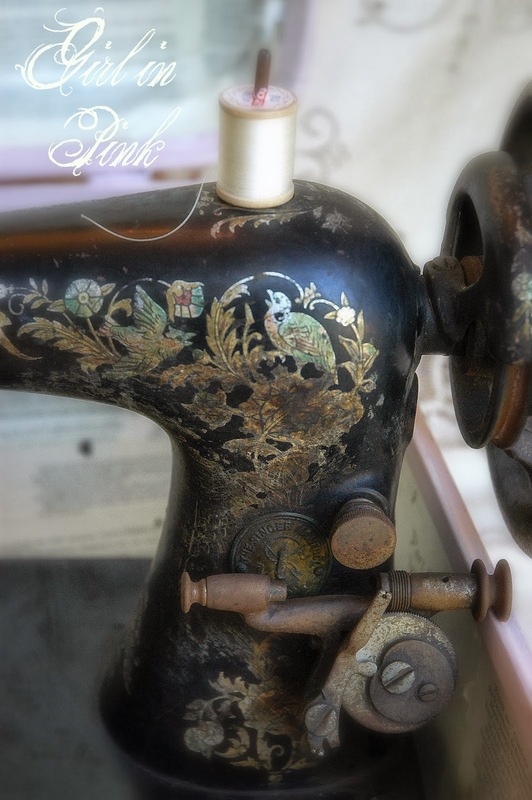 The craftsmanship and detail put into these old machines just fascinates me. 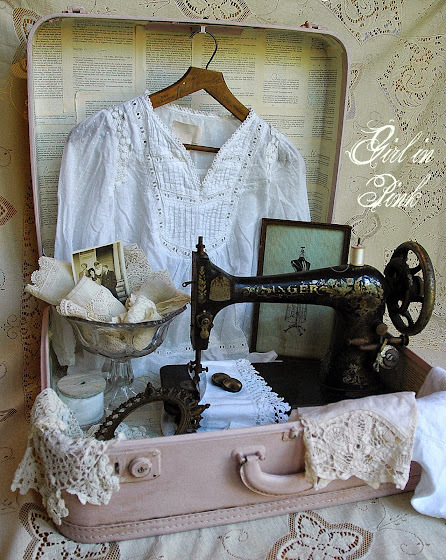 The freshly painted book page lined suitcase turned out to be the perfect host for a little sewing vignette. I plan to take it to the shop this week along with some vintage sewing notions and linens. 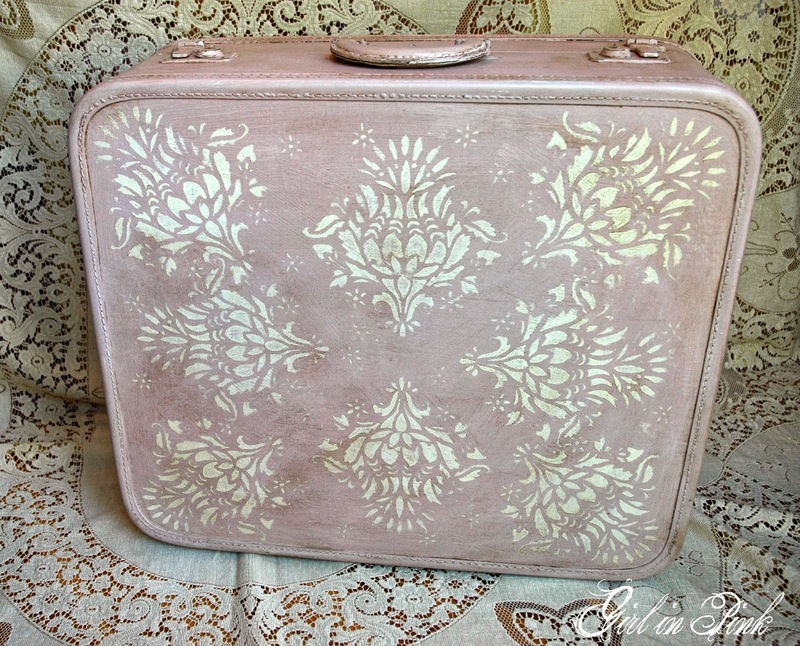 The exterior of this case was also painted in Antoinette and I went a little crazy with a stencil in Old White. After a coat of clear wax, I added a good amount of dark to give this piece that old, weathered and worn look. That's one boring old stinky suitcase restyled, repurposed and de-odorized! 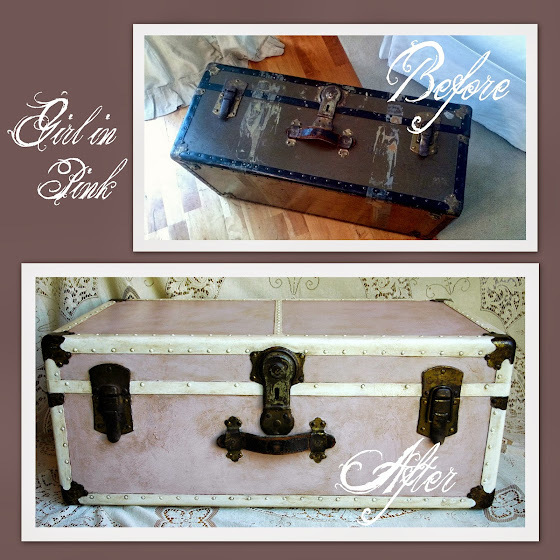 Don't overlook trunks and luggage at estate sales and thrift shops just because the exterior has ugly stickers or tape residue, or isn't a desirable color, or the interior lining is ripped stained or smelly! These pieces are fantastic for storage and/or display. 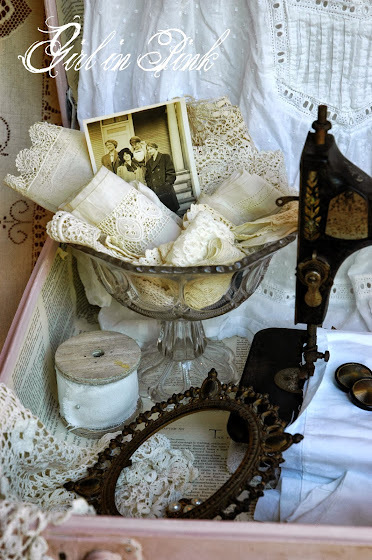 With Chalk Paint®, and a little imagination these pieces can be beautiful and functional once again! Thank you so much for your sweet visit today! Enjoy the rest of your week! Get out there and create something lovely!